Systematic reviews show home visits can reduce maternal morbidity and perhaps maternal mortality in low-income and middle-income countries; the impact is greater when coverage is higher. The mechanism for the impact of home visits is unclear; in some studies, home visits increased institutional deliveries, but they did not increase skilled birth attendance. The home visits were universal, with no pregnant women left out; the visitors shared recent local evidence about ‘upstream’ factors associated with maternal morbidity, encouraging household discussions, rather than encouraging women to attend routine antenatal care and to deliver in facilities. The home visits improved upstream risk factors and reduced complications of pregnancy and postnatal sepsis, without significantly increasing the load on facility-based antenatal or delivery care. Universal home visits that share evidence and provoke discussion between pregnant women and their husbands change upstream risk factors. Such home visits can reduce maternal morbidity without increased load on facilities for antenatal and delivery care, so could be relevant in places with high maternal mortality and poor maternal care services. Maternal mortality is an urgent problem in Nigeria, which has a reported maternal mortality ratio (MMR) of 814, among the highest in the world.1 The situation is likely to be worse in the north of the country: a study in Bauchi State referral hospital reported 621 deaths in 12 067 un-booked deliveries (5.1%).2 Much of the current discussion about maternal mortality hinges on attendance at facility-based antenatal care and deliveries.3 But an analysis based on the 2013 Nigeria Demographic and Health Survey4 reported that only 11% of women attending routine antenatal care (ANC) received a minimum acceptable quality of care and only 5% the desirable quality of care, and these figures were worse in the north.5 Quality of care was based on 10 reported components of service at ANC visits. Focus groups identified costly, poor-quality and inaccessible services, and uncooperative partners as reasons why women did not attend ANC.6 Encouraging women to attend underfunded and low-quality services will not improve the already strained quality of care and may even compromise it further. This suggests a need to look upstream for ways to improve maternal health by influencing the conditions that produce risk factors for poor maternal outcomes. Maternal mortality and lack of ANC are related to the same structural factors in many developing countries: extreme poverty, powerful gender disparities, social marginalisation and low levels of education.12 A cluster intervention addresses many of these contextual variables shared by neighbours. Knocking on the door of the home of every pregnant woman to discuss pregnancy risks with her and her spouse can be a structural intervention. It reduces the isolation of individual women and provides a strong message about the value of every pregnant woman. If all households are included, the intervention should reach those who do not attend ANC yet may be at high risk of adverse outcomes. All women of childbearing age (14–49 years) in all households in the intervention wards were eligible for the study. Each ward included urban, rural and rural remote communities. Among these women, all those who became pregnant during the study period were visited at home several times during their pregnancies; their husbands were also visited during the pregnancies. The protocol provides a full description of the intervention.14 Each home visit team of one woman and one man covered around 300 households and visited every household every 2 months. The female home visitors typically visited the households and followed the pregnant women during daylight hours, while the male home visitors typically visited the same households and spoke to the spouses of the pregnant women in the evenings or at weekends, when the men were at home. We recruited the home visitors mostly from the intervention communities, and trained and evaluated them before they began the work. On the first visit, the female visitor asked about household demographics and socioeconomic status. On each subsequent visit, she checked how many women of childbearing age were in the household, noted how many were pregnant, and followed those registered as pregnant with a surveillance questionnaire and discussion about the four issues related to pregnancy risk in a previous study in the state: heavy work in pregnancy, experience of domestic violence, lack of communication with the spouse and lack of knowledge about pregnancy danger signs.13 Male visitors separately interviewed and held discussions with the partners of the pregnant women, also every 2 months. The intention was to provoke household discussion and action on the risk factors. A visit after delivery recorded information about the whole pregnancy and delivery. The home visitors entered interview responses directly into GPS-enabled android handsets preloaded with information for the home visitors to share with pregnant women and their spouses, along with instructions for referring pregnant women who reported danger signs to a local clinic. They uploaded records to a central server after each visit. We used open-source Open Data Kit software for the electronic data collection.17 The GPS locations included in the uploaded records allowed us to check that the home visitors actually conducted interviews in the intended households. The home visitors did not routinely encourage pregnant women to attend for routine ANC or to deliver in health facilities. However, recognising that some visited women might report danger signs during their pregnancies, home visitors’ training included this eventuality and their handsets carried a decision aid of what to do in different cases, including when to refer to a health facility. The training stressed the importance of conducting all interviews with privacy and covered practical ways of ensuring privacy in the household setting in Bauchi. It also covered how to handle any distress caused by discussion of sensitive topics, such as domestic violence. The study conformed to the principles embodied in the Declaration of Helsinki. The research team discussed the home visits with the leadership of all communities in the participating wards to get their approval to proceed. We treated all responses from participants as confidential, with no names or identifying information recorded. The primary outcome was maternal morbidity during pregnancy and within 6 weeks after delivery, as reported by women after completed pregnancies. The questionnaire asked about pregnancy complications including severe headaches, swelling of hands and feet, dizziness or blurred vision, high blood pressure (if measured during the pregnancy), convulsions and vaginal bleeding during pregnancy. It also enquired about perineal trauma (cut or tear) during delivery and delivery by Caesarean section. Postpartum complications included wound opening, high fever and smelly discharge. We defined postpartum sepsis as the presence of any one of these three complications. Behavioural and knowledge indicators specifically targeted by the visits were heavy work during pregnancy, experience of verbal and physical domestic violence, communication with the spouse about pregnancy and delivery, and knowledge of danger signs during pregnancy and delivery. Indicators of access to healthcare were at least one ANC visit to a facility, at least one blood pressure measurement, urine tested at least once, delivery attended by a trained health worker (community health worker, nurse, midwife or doctor), delivery in a health facility, and a postnatal visit within 6 weeks. In the intervention wards, the home visitors followed pregnant women with bimonthly visits and administered an electronic questionnaire after delivery; we included in the present analysis all post-delivery questionnaires completed up to 31 December 2017. In the pre-intervention wards, the home visitors administered the same questionnaire to women in the baseline visit, asking about completed pregnancies in the last 12 months. Our sample size calculations used the clinical trials simulator of Taylor and Bosch.18 Our 2013 study in the same local government authority16 found 60% of women did not reduce heavy work in pregnancy and 58% reported postpartum infection or another serious complication of pregnancy. At this frequency, with an estimated 2880 births in each ward over a 2-year period, our study could detect a 20% reduction in complications (80% power at the 5% level, k=0.05) between two intervention wards and the two pre-intervention wards. The study was not powered to show an impact on maternal mortality, although this should be measurable with later roll-out to other local government authorities. The Toro MMR (around 800 per 100 000 live births) implies around 35 maternal deaths in each ward over 2 years. The wards with home visits would have to reduce mortality by 35% to be detected with 80% power at the 5% level (k=0.06). At the beginning of the study, random allocation of six participating wards in Toro Local Government Authority generated three groups of two wards each. An epidemiologist not involved in the fieldwork (NA) generated the allocation sequence. We first divided the six wards into two sets, geographically apart. For each group of two wards, we randomly selected one ward from each of these two sets. We report here the comparison of outcomes at 1 year between the first group of two wards (intervention wards) and the second group of two wards (pre-intervention wards). The third group of two wards will receive visits after a further year’s delay. There was no possibility to conceal allocation once the intervention began. The home visitors conducting interviews for measuring outcomes could not be blinded to group assignment but, hired simply to visit households and interview participants, they did not have any reason to interview differently in intervention and control sites. Ward was the unit of randomisation, intervention and analysis. We used the Mantel-Haenszel procedure19 adjusted for clustering (Lamothe method)20 to examine differences between the intervention and pre-intervention wards at baseline. This first assessment of the impact of home visits contrasted primary outcomes after 1 year between the intervention and pre-intervention wards. Prespecified ancillary analyses used generalised estimating equations for logistic regression (exchangeable matrix, 1000 iterations), assuming an exchangeable correlation structure within wards, to incorporate the cluster design, any differences at baseline, and any differences in use of health services during the pregnancy and delivery.23 This analysis examined the possibility that these differences between intervention and pre-intervention wards explained the findings. We wanted to be sure any impact of home visits was not simply due to baseline differences, or to increased use of health services during pregnancy and delivery. A supplementary analysis examined associations between reports of pregnancy complications and attendance at ANC and delivery in health facilities. Figure 1 shows the flow of clusters and individual participants through the trial. Implementation followed the protocol. Recruitment of participants for home visits within the first two wards began in March 2016. Recruitment of participants for home visits in the second two wards began about 1 year later. We compared maternal pregnancy and delivery outcomes between the intervention and pre-intervention wards using data on completed pregnancies accrued in the intervention wards during approximately 1 year of intervention, and collected from the pre-intervention wards in their baseline visit before starting the intervention there. Participant flow in the trial. We report here the analysis of data from 3690 women reporting on completed pregnancies: 1837 women in households in the intervention wards and 1853 women in households in the pre-intervention wards. There were 2271 women expected to complete pregnancies in the pre-intervention wards by 31 December 2017; 1837 (81%) of them completed a post-delivery questionnaire. This is an underestimate of the follow-up rate because some of the remaining women completed the post-delivery questionnaire after the 31 December cut-off. Table 1 shows baseline characteristics of women in the intervention and pre-intervention wards. The proportion of women from non-remote communities was higher in the intervention wards than in the pre-intervention wards. Compared with women in the pre-intervention wards, women in the intervention wards were more likely to be from a household with an educated head and more likely to have some formal education themselves. The proportion of women in the low-risk age group for pregnancy (18–35 years) was lower in intervention wards; a higher proportion were adolescents (age 14–19 years), while the proportions over 35 years old or over 39 years old did not differ between intervention and control wards. A higher proportion of women in the intervention wards had less than five previous pregnancies. We use food insufficiency in the last 1 week as an indicator of severe poverty and this did not differ between intervention and control wards. 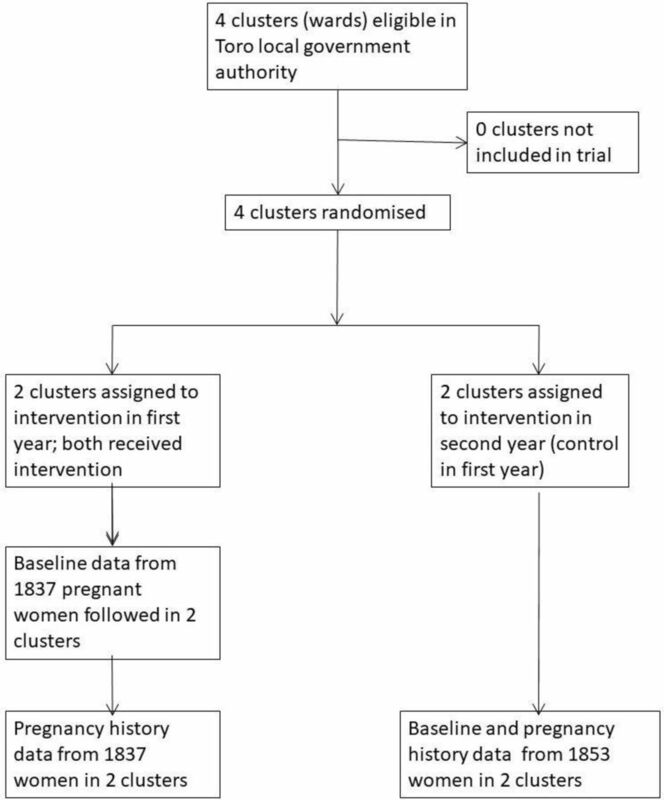 Table 2 shows reported pregnancy, delivery and postnatal complications, compared between intervention and pre-intervention wards on an intention-to-treat basis using the cluster t-test. Except for convulsions during pregnancy, which affected less than 1% in the intervention group and 5% in the control group, all the reported pregnancy complications we measured were significantly less common in the intervention wards. The proportions of women reporting perineal trauma or Caesarean section, or other problems during delivery, were not significantly different between intervention and pre-intervention wards. Women in the intervention wards were significantly less likely to report fever or smelly discharge within 6 weeks. The reduction in rate of postpartum sepsis (any one of the three elements of wound opening, fever or smelly discharge) was 32.4%, corresponding to a NNT of 3. There were statistically significant improvements in the risk behaviours and knowledge targeted by the home visits in the intervention wards (table 3). Compared with women in the pre-intervention wards, women in the intervention wards reported less heavy work in pregnancy and less physical domestic violence in pregnancy; they reported more communication with partners about pregnancy and delivery, and they had better knowledge of danger signs during pregnancy and delivery. Table 4 shows the use of health services during pregnancy, delivery and post partum in women in the intervention and pre-intervention wards. For most of the measured variables, the proportion of women who used services was slightly higher in the intervention wards, but none of the differences was significant at the 5% level. As shown in the tables in online supplementary file 1, baseline differences or differences in use of health services did not explain the impact detected on the outcomes in tables 2 and 3. In some cases, including baseline variables and use of services in the model increased the strength of association between the intervention and the outcome (online supplementary file 1). The supplementary analysis of associations between reports of pregnancy complications and use of health services found that, for most pregnancy complications, women with the complication were somewhat more likely to attend ANC and to deliver in a health facility, after stratifying by intervention status (online supplementary file 2). These associations were significant at the 5% level only for persistent headache and dizziness or blurred vision and ANC attendance. The strength of associations between complications and use of health facilities was not significantly different between intervention and control wards. Since there was less than 1% missing data for the main outcomes of complications in pregnancy and delivery and targeted risk factors and for baseline characteristics (except for information about the household head) in both the intervention and pre-intervention wards, we did not conduct multiple imputation to examine the possible effect of missing data. We did not include characteristics of the household head in any of the adjusted analyses shown in online supplementary file 1. In 1100 of the 12 359 visits to pregnant women (most women were visited several times) in the intervention wards, the visited woman reported one or more danger signs. The most frequent report was of persistent severe headaches, reported in 621 (56.5%) of cases, and dizziness (352, 32%). The female workers gave referral slips for a nearby clinic to the woman in 977 (89%) of these cases. They followed up 347 of these referrals on subsequent visits; 212 (61%) had visited the clinic as advised. The Toro trial sought to assess the impact of universal home visits on maternal outcomes. We found a clear advantage in the intervention wards. Universal home visits to pregnant women and their husbands reduced nearly all the reported complications in pregnancy that we examined and reduced reported postpartum sepsis. They also reduced reported domestic violence during pregnancy and improved the other targeted risk factors (heavy work in pregnancy, lack of spousal communication and lack of knowledge about danger signs). The improvement in outcomes was not due to increased use of health services. Use was slightly higher in intervention wards than in pre-intervention wards, but the difference was not significant at the 5% level, and the ancillary analysis indicated that the improvement in outcomes in the intervention wards was not explained by the higher use of health services during pregnancy and delivery in these wards. Our findings advance the available evidence about home visits to pregnant women, especially universal visits in contexts with high maternal mortality and limited access to services. A 2014 systematic review of community interventions dealing with birth preparedness and complication readiness included 14 randomised trials in developing countries, five including home visits.9 The authors concluded that the interventions reduced maternal mortality when they covered more than 30% of the targeted women. Based on few studies, home visits seemed most effective when combined with community-based group sessions. Lassi and Bhutta reviewed 26 cluster-randomised or quasi-randomised trials of community interventions to improve maternal and newborn health, 19 of them from Asia and 17 of them including home visits.8 They found an impact on complications of pregnancy and delivery, with a possible impact on maternal mortality. The three recent systematic reviews of community-based interventions found no increase in skilled birth attendance associated with the interventions that included home visits8 9 11; two found an increase in institutional deliveries.8 11 A 2015 trial in Tanzania reported home visits increased institutional deliveries,24 and a systematic review of interventions to increase attendance at ANC concluded they did so without improving maternal mortality.25 Our finding of no significant increase in use of antenatal and delivery services in the intervention wards suggests that reduction in the upstream risks led to the improved maternal outcomes we documented. The home visitors in our study referred women with danger signs to a local clinic (in about 8% of visits), but despite this the women in intervention wards did not report a significantly higher rate of ANC visits. Women with danger signs were somewhat more likely to attend ANC in both intervention and pre-intervention wards, but most associations were not statistically significant and were not stronger in intervention wards. The stronger impact with higher coverage noted in the Soubeiga et al review9 is not surprising because the same factors that increase maternal risk also limit their ability to attend health facilities for ANC26 and probably to participate in women’s groups. The women not reached by an intervention with partial coverage may well be the most at risk. The home visits intervention in our study deliberately set out to visit all pregnant women in a defined area, to ensure we reached the most marginalised women. Studies of institution-based ANC care are almost all confounded by the fact that attendance is not random but determined by the very factors that put pregnant women at risk27; our trial took antenatal education and discussion to every doorstep and provides evidence of impact including among those at most risk. Our findings are relevant to other parts of Bauchi and Nigeria, and probably also to other countries with high levels of maternal mortality and underfunded health services. Since the intervention did not address facilities or healthcare practices, any impact will be limited to upstream determinants. Universal home visits should result in more referrals of those who need the extra attention to survive, so they could increase the demand on services. An important concern is ensuring sustainability of universal home visits, through policy and allocation of resources. Our project took a participatory approach to integrated knowledge translation, involving research users throughout the research process.30 Government officials, healthcare providers and communities in Bauchi State contributed to the research design. As planned in the overall stepped-wedge trial, trained government officers have now taken over the management of the home visits in the first two wards.14 We expect our trial, with its embedded training of government officers, will help to consolidate the lessons local stakeholders draw about their own system. Because the visits reached all pregnant women, and their spouses, at home, we could measure the impact on all women, including those who would not access institution-based interventions or even community groups. Self-reports of pregnancy and delivery complications could potentially be unreliable, but there is no reason to believe women in intervention wards, who were significantly more aware of danger signs, would under-report complications compared with women in pre-intervention wards. If anything, the measured impact is likely to be an underestimate. There were only two wards (clusters) each in the intervention and control groups, and it is possible that there was an imbalance of unmeasured cluster-level covariates between the groups. The possibility of serious imbalance is reduced by the fact that all the clusters were in one local government authority area, which is quite homogeneous in terms of religion, ethnicity and socioeconomic status. The Toro trial is the first to confirm impact of universal home visits on maternal outcomes in West Africa. The home visits reduced upstream maternal risks, improving outcomes without increased use of health services. This service delivery strategy, reaching all pregnant women, could be relevant in places with high maternal mortality and poor maternal care services. We thank the home visitors and their supervisors for their conscientious work collecting data and supporting women and their spouses, and the women and men in the communities in this study who gave their time to respond to questionnaires. , 2015. Trends in maternal mortality: 1990 to 2015. Estimates by WHO, UNICEF, UNFPA, World Bank Group and the United Nations Population Division. Geneva: WHO. Available: http://apps.who.int/iris/bitstream/handle/10665/194254/9789241565141_eng.pdf [Accessed 13 Sep 2018]. , 2015. WHO recommendations on health promotion interventions for maternal and new-born health 2015. Geneva: WHO. Available: http://apps.who.int/iris/bitstream/handle/10665/172427/9789241508742_report_eng.pdf [Accessed 13 Sep 2018]. , 2014. (NPC) and ICF international. Nigeria Demographic and Health Survey 2013. Abuja: National Population Commission and ICF International. Available: https://www.dhsprogram.com/pubs/pdf/FR293/FR293.pdf [Accessed 13 Sep 2018].
. Community-based intervention packages for reducing maternal and neonatal morbidity and mortality and improving neonatal outcomes. Cochrane Database Syst Rev 2015;3:CD007754.
. Social audit on primary health care Millennium Development goals: Toro local government authority scorecard 2009–2013. Bauchi State Primary Health Care Development Agency, 2013.
, 2018. Available: https://opendatakit.org/ [Accessed 13 Sep 2018].
. Statistical aspects of the analysis of data from retrospective studies of disease. J Natal Cancer Inst 1959;22:719–48.
. Generalized estimating equations. New York: Chapman and Hall and CRC, 2001.
. Health system and community level interventions for improving antenatal care coverage and health outcomes. Cochrane Database Syst Rev 2015:CD010994.